Most Mettlach steins are clearly identifiable by a factory trademark (such as a Mercury trademark or an Old Tower trademark) found on the bottom of the stein. However, there are several groups of Mettlach steins which frequently do not have a factory trademark. 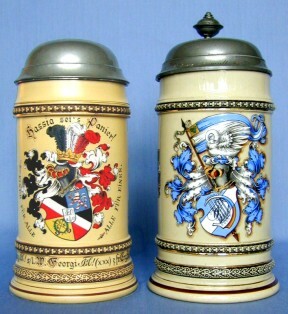 One such category is the custom-decorated handpainted steins which often are decorated with fraternal coats-of-arms or various other heraldic devices. Some of the more common form numbers for such steins are 62, 280, 282, 385 and 386. 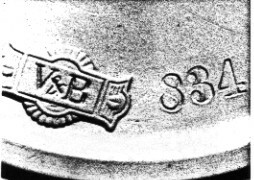 With these earlier Mettlach form numbers (two or three digits), the only factory trademark that I have seen on the custom-decorated steins is the incised joined letters V and B. This mark is present on only about 70% of such steins. Additionally, it is not unusual for the date of manufacture to be missing (i.e., not incised on the base). On some of these steins, the quality control number is also missing. With the less common later form numbers such as 2152, 2197, 2233 and 2413, the normal factory trademark was the Old Tower, and it appears on about half of such steins. A probable reason for omitting the factory trademark is that these custom-decorated steins were frequently commissioned by a vendor who had his own trademark(s) stamped on the bottom of the stein. Thus it is not rare to find that a custom-decorated Mettlach stein has no factory trademark and that only the form number is incised on its bottom. 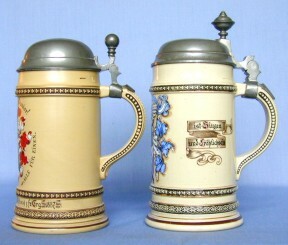 For such steins, it is necessary to be able to distinguish between the Mettlach and very similar steins made by some other unidentified manufacturer (see figures 1 and 2). It is important to be aware of and look for those distinguishing characteristics that are essentially objective, easy to understand and remember, and, above all, observable under all ordinary circumstances where making such a distinction would be necessary. The premier characteristic satisfying these specifications is the configuration of the numerals that are impressed into the Mettlach item. Figure 3 - Stamped mark of the decorator of the Mettlach stein, Freidr. von Hauten, Bonn am Rhein. The center image shows Mettlach form number 280. The look-alike (right) shows the name of the decorator (C. Werner of Heidelberg) and an impressed form number 433 (indistinct in this photo). Figures 3 (center) and 4 show the type of incised numerals found on the vast majority of Mettlach stoneware items made prior to World War II. 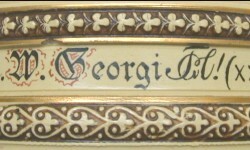 This same type of incised number is also found on certain types of Mettlach earthenware items such as steins (forms 1526, 1909, etc. ), plaques (form 1044, etc.) and coasters (form 144). This configuration of numeral was introduced in about 1880 and within a few years evolved to its "final" form. Actually, there is no specific configuration. Rather, there is a more or less consistent family of similar configurations [compare the 1's, 6's and 9's in these illustrations]. 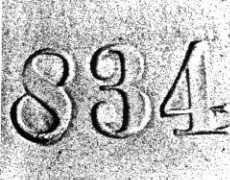 Figure 4 - Incised numerals which are characteristic of Mettlach. What characterizes these Mettlach numerals is the fact that each digit apparently was hand formed from one or more pieces of sheet metal. Also, apparently, each individual required to use such number had to make his own sets. Thus there was a wide range of slightly different styles. A zero might be a sheet rolled into a closed tube or, in some instances, it was so far from being closed that it looks more like a letter C. Some of the eights are almost like a letter S and other eights are simply a smaller tube on top of a larger tube. A second type of impressed numerals found on Mettlach stoneware made prior to about 1880 is as shown in figures 5. These very distinctive numbers are apparently made from cast dies and, therefore, are quite homogeneous and uniform. with the applied V&B factory trademark and the die-cast form number. Another characteristic of Mettlach steins (1.0-liter or less) is that the capacity fluid level mark is a painted line (figure 7) whereas it is frequently an impressed line on the steins made by other manufacturers (figure 8). Figure 6 - Capacity marks, Mettlach on the left, look-alike to the right. There are many other ways in which the Mettlach in Figure 1 is distinguished from the look-alike in figure 2. However, these other distinctions are either (1) less apt to exist in other cases, or (2) less reliable, or (3) more difficult to make when you find a stein at a flea market and must make a quick decision. A characteristic of Mettlach stoneware steins is that the bottom has a multitude of axially concentric circles apparently produced by some spinning and cutting process. Sometimes, when these concentric circles are minimally present or when the glaze is relatively heavy, it is almost impossible to see them except with a very strong light source at a particular angle. These concentric circles are slightly observable in figure 3. Such concentric circles are not present on the base of the look-alike stein. One significant distinction between the steins in figures 1 and 2 is the orientation of the decorations on the relief bands on the stein bodies. All three bands on the look-alike are reversed from the Mettlach. This is most readily seen in figures 7 and 8 which show a section of the upper relief bands. By itself alone, this reversal of the decorative bands is not a conclusive distinction since such reversals (usually of only one band) will occasionally be found on genuine Mettlach steins. Figure 7 - Upper band of the Mettlach stein on the left, look-alike to the right. Figure 8 - Lower bands of the Mettlach stein, left, and look-alike, right. A distinguishing feature that is more difficult to assess is the type of glaze that was used. In general, Mettlach stoneware (but not their earthenware) has a thin matt glaze that is rarely crazed. Although it is difficult to see clearly, figures 3, 6 and 8 all give a sense of the heavier glaze on the look-alike.